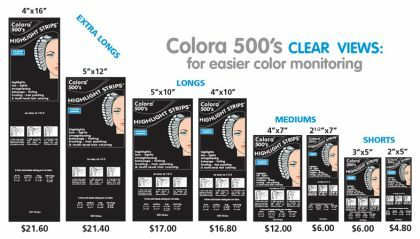 Size: -- Select -- 2"x5" 3"x5" 2.5"x7" 4"x7" 4"x10" 5"x10" 5"x12" 4"x16"
For balayage, highlighting, frosting, tinting and multi-level hair coloring and continuous monitoring of colors while they develop. Each box contains 500 strips. 1. Place strip shiny side up on the highlight board, making sure strip is as close as possible to scalp. 2. Apply mixture to the hair using your highlight board as support. 3. Fold strip in half and squeeze top gently. The strip will adhere to itself. Remove highlight board.